The DaVinci Film Festival is pleased to SPOTLIGHT CoffeeRing Entertainment’s “She Will Be Loved”, written and directed by Chadwick Pelletier. The 30-minute drama comes on the coattail of CRE’s award-winning short, FOR BLOOD, and is expected to make quite an impact in the festival circuit 2017-18. Pelletier’s hope for the picture is to reach at least one person who suffers from this debilitating disorder of wartime PTSD, and give hope though this dramatic narrative. A soldier’s journey to overcome the strongholds of wartime PTSD, and pull a fractured life back together. Christine Miller [Constance Brenneman] is the lone survivor of an IED strike overseas. Soon after a MedTrans flight to Washington D.C., she begins her road to recovery — picking up the pieces of a fractured life and accepting her new disability. 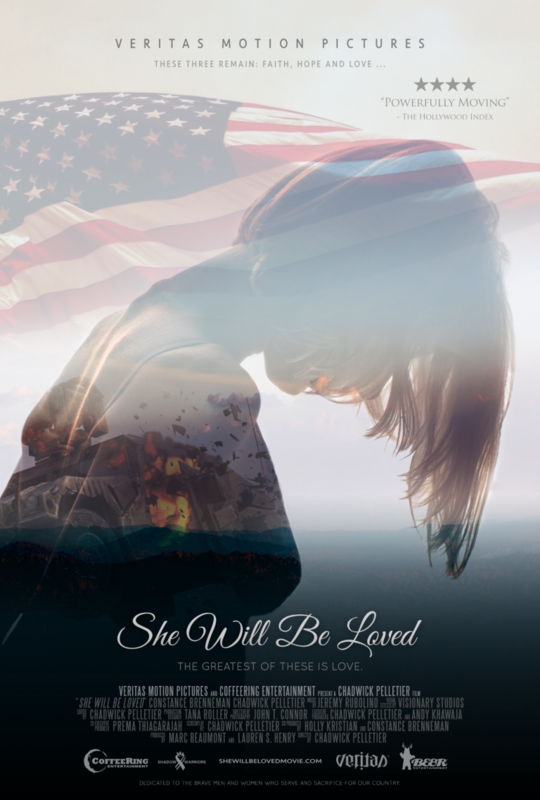 She Will Be Loved follows Christine through her healing process, as she struggles with a new identity, marriage crisis, and survivor’s guilt in order to conquer wartime PTSD. All information, including YOUR name should be sent to: spotlight@tdiff.org. Creative (filmmaker, documentarian, Creator or otherwise “DIFF Submitter”) cannot nominate themselves. DIFF Submitter must be nominated by a third party. Third Party must submit screener of project for consideration. If project is chosen as DIFF SPOTLIGHT we will [then] ask for marketing materials for our webpage (Copy, One Sheet, BTS, and trailer/teaser). PLEASE DO NOT SEND US THIS MATERIAL UNTIL THE PROJECT HAS BEEN SELECTED AS OUR SPOTLIGHT WINNER. Project can not be more than two (2) years old. SPOTLIGHT honorees do not have to be DIFF Award winners to qualify. Project can not promote or display material of an offensive nature. This is not subjective. HOT LINKS / LIVE LINKS: DIFF, owners, managers, employees, affiliates, or otherwise associated with The DaVinci Film Festival LLC, does not directly or indirectly endorse any material on third party websites that are linked from our SPOTLIGHT web page.